Leblanc Plumbing & Heating provides sales, service and installation of heating, cooling and plumbing systems to Tisdale and surrounding area. We are a locally owned and operated company, and a SaskEnergy Network Member. Our experienced technicians offer gas fitting services for the installation of fireplaces, barbeques, stoves, dryers and water heaters. Whether you are a residential, industrial, commercial or an agricultural client, the highly skilled team at Leblanc can be of assistance to you. 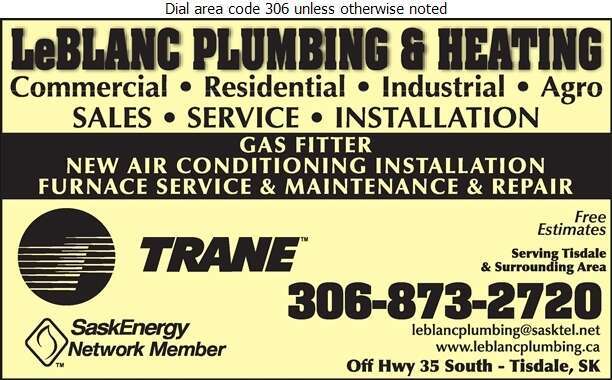 Call Leblanc Plumbing & Heating for all your heating, cooling and plumbing needs. We would be happy to provide you with a free estimate!